Taking profits on our short positions and closing them on Thursday turned out to be a good idea. Gold, silver and – on an intraday basis – mining stocks moved higher on Friday, while the USD Index declined. But, is the rally over after just one day? 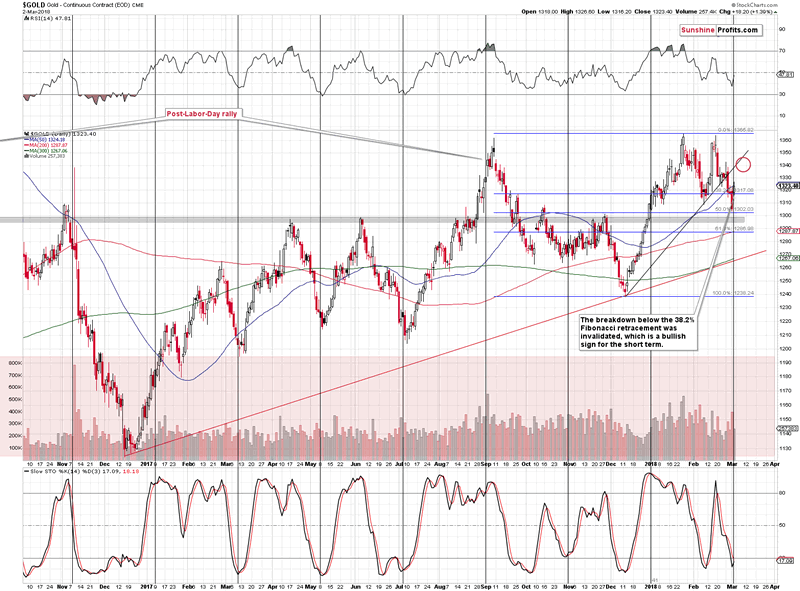 Not likely – gold’s and miners’ turning points are likely to result in something more than just a daily rally. So, how high is gold likely to rally this time? That’s what we discuss in the following part of today’s alert. But first, let’s take a look at what happened in the USD Index (chart courtesy of http://stockcharts.com). In the previous analyses, we wrote that we were still skeptical about the USD’s upswing as the confirmation of the USD’s move above the medium-term support / resistance line was still rather weak. The less bullish view of the situation turned out to be true, as the index closed the week once again below the mentioned declining line. 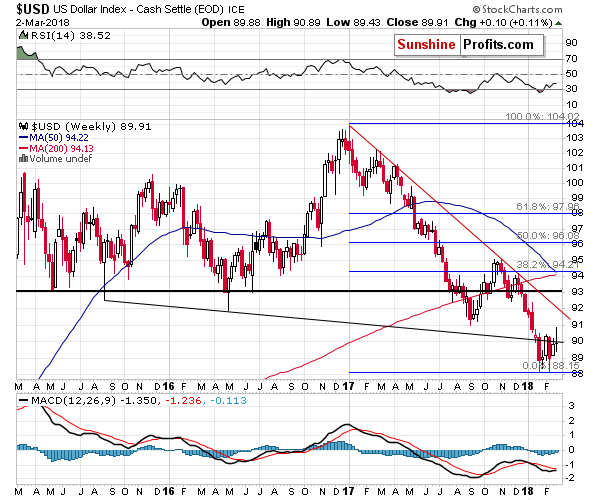 The interesting thing is that it happened after the USD Index corrected to the 38.2% Fibonacci retracement based on the November 2017 – February 2018 downswing. The former means that the move lower was not accidental but was likely a way for the USD to take a breather during the rally. The move below the medium-term declining line means that the downswing may not be over. Previously, when the USD moved below the medium-term line, it moved to new 2018 lows, and traders definitely remember it. Therefore, some of them will likely bet on the repeat of that scenario. But, will they be correct? The decline to the February low could be seen, but we doubt it. After all, the USD is after breakouts above the declining short-term support / resistance lines, so a move back to one of them seems more likely. 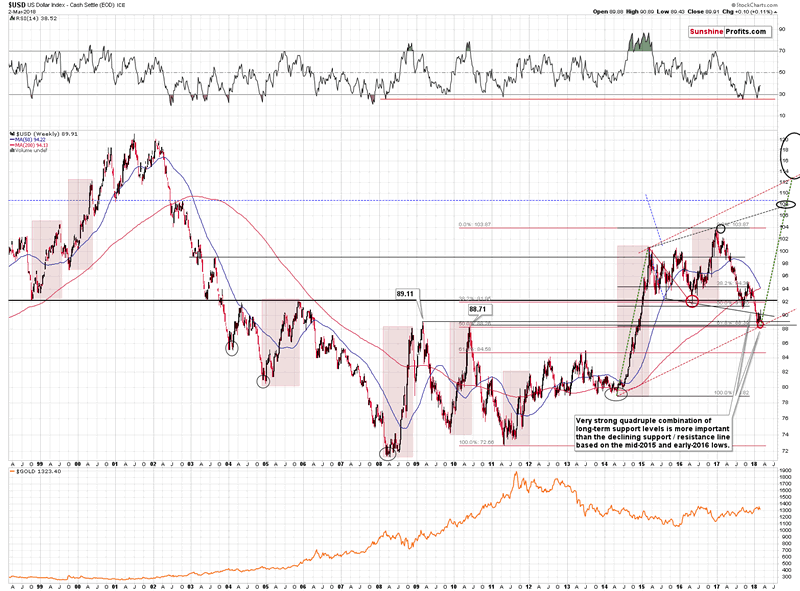 This means the USD could decline to about 89 or so before the rally resumes. We marked the target area with a red triangle. We think that the declining support line will trigger a reversal and we don’t think that the decline will take longer than a week. The latter is based on the pace at which the USD declined previously and also on gold’s triangle apex reversal – if gold is likely to reverse course in a week or so, then something similar could be seen in the USD. Let’s keep in mind that the USD Index is above a combination of very strong support levels stronger than the mentioned medium-term support/resistance line. So, the fact that the USD closed the previous week below it, has only short-term implications, not long-term ones. The apex of the triangle marks an important reversal date. We elaborated on this technique in the previous alerts, so we don’t want to go into the details once again. Long story short, the usefulness of this technique has been confirmed for the precious metals sector multiple times, including the recent cases (including the February 9 powerful reversal in mining stocks), so it’s something gold traders should take into account. What we would like you to focus on is that we posted the above chart a week ago and wrote that a reversal could be seen in two weeks. One week has already passed, so we should now expect gold to reverse its course either late this week or early during the next. The employment numbers are going to be released on Friday and they are quite often accompanied by volatile price swings. This could be the perfect trigger for the final part of the gold’s upswing. Mario Draghi is going to provide his comments on Thursday, which could also trigger some price swings. Overall, it seems that we should prepare for a Friday reversal and either back and forth movement or an upswing in the meantime. But how high can gold go? Gold could move to the $1,340s before the rally is over – we marked it with the red ellipse. Why there? That’s where we have the previous intraday high and the rising resistance line. The combination of these short-term resistance levels and the pace at which gold usually rallied both fit a scenario in which gold forms the next local top about $20 higher at the end of the week or very close to it. Again, let’s keep in mind that a short-term really is most likely all that we’re going to get. There are too many bearish long-term factors in play, to view the recent strength as anything more. The target for silver is analogous to the one for gold. It seems that the previous high along with the 50-day moving average could stop the rally. To be precise, a small breakout above these levels would not be surprising as that’s what silver tends to do as a confirmation of a top (providing fake breakout signals – by the way, we compiled a list of such tips for gold and silver traders). That’s why the target area is quite wide. The January 2018 – February 2018 decline is a quicker version of the September – October 2017 downswing. The subsequent corrections are very similar – in both cases, silver moved a bit above the 50% Fibonacci retracement, but not above the 61.8% one. The following decline erased most of the correction. Then, back and forth trading started where intraday highs were not as high as the highest intraday price of the preceding corrective upswing. The intraday lows of subsequent sessions were increasing. The initial corrective upswing also took silver above both moving averages: the 20- and 50-day one. Then, the back and forth trading took place around the red moving average, but below the blue one. That’s what happened on Monday – silver moved a bit above the red MA, but not above the blue one. Having established the self-similarity, let’s see how we can use it. Combining the above price and time analogies, we get the target that we marked with a red ellipse on the above chart. The target is quite wide and there are good reasons for it. Back in November, silver topped below the previous top, but silver is known to get ahead of itself during these intraday outperformance cases, so we’re not ruling out a scenario in which it “breaks out” above the mid-February top only to invalidate the “breakout” shortly thereafter. As far as time is concerned, please recall that in Monday's free analysis we thoroughly discussed the apex triangle reversal technique for gold and it pointed to two scenarios: one in which the top is already in and a second one in which the top is going to be in in about two weeks (a bit less, counting from today). Moreover, gold’s cyclical turning point is tomorrow, so it could be the case that it triggers silver’s rally and the subsequent reversal. Overall, it’s rather unclear when precisely the silver reversal will take place, but we know more or less when to expect it and we know what signs to look for as a confirmation (silver’s breakouts above the declining, short-term resistance line and the 50-day moving average). Speaking of apex-triangle-based reversals, please note that the above chart shows yet another confirmation of this technique’s usefulness. The triangle based on the October and November 2017 lows (solid line) and the September and November 2017 tops (dashed line) had their apexes exactly at the time when one would want to reverse their short positions or close them. Perhaps applying this technique to the upcoming decline will serve as a way to detect a short-term reversal as well. We put the key fragment in bold. 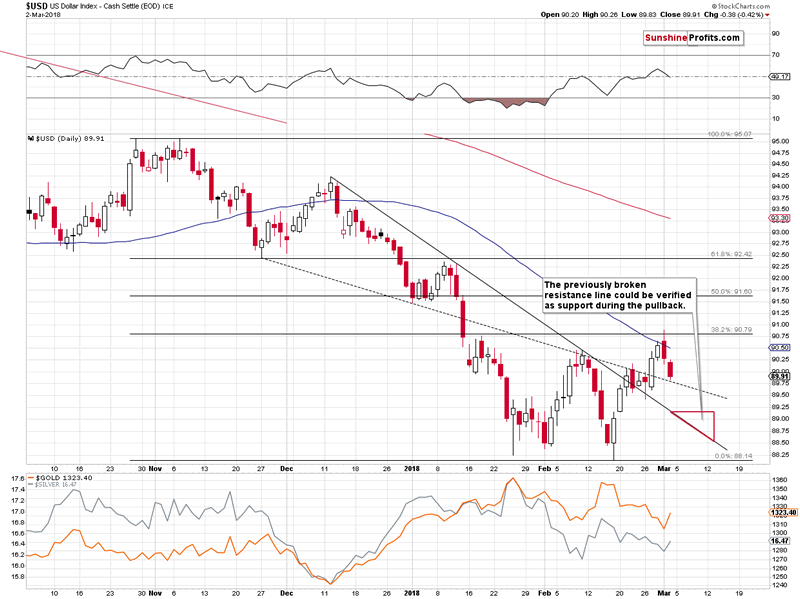 Silver’s breakout above the declining, short-term resistance line is at hand and the 50-day MA is not very close yet. 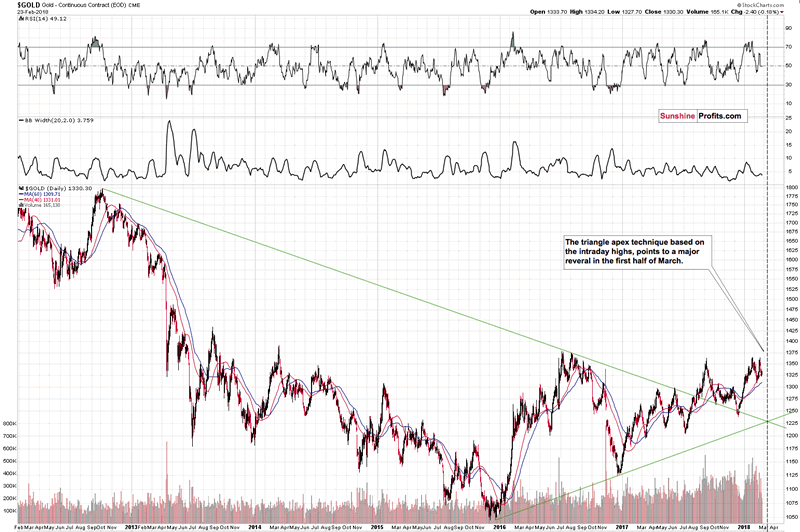 Therefore, silver has some room to rally before the confirmation of the final top is in. The above chart illustrates how gold, silver and mining stocks performed relative to each other. It seems that the last two trading days provide conflicting signals, so we’ll take the last three trading days into account. 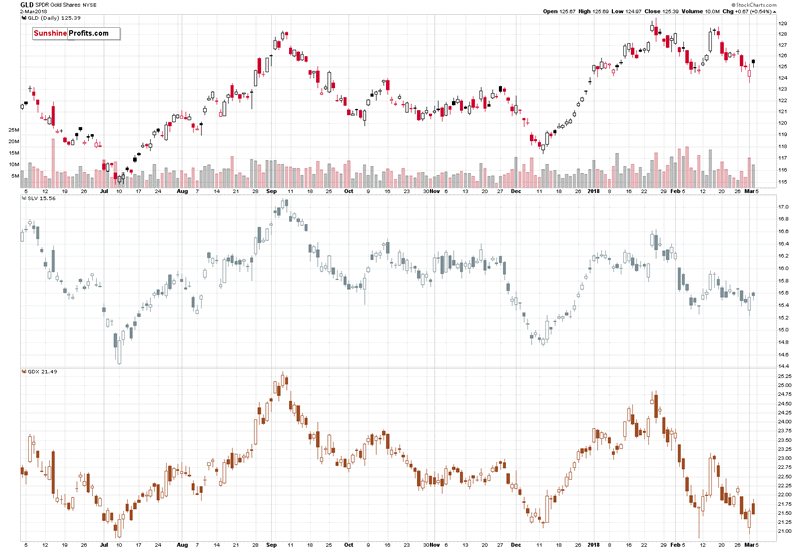 By doing so, we get the situation in which GLD and SLV are a bit higher and miners (GDX) are up by only a little. This is a subtle sign showing that the rally in the precious metals sector may not be something huge. If it was, miners would be leading the way in a decisive manner – that’s definitely not the case based on what happened on Friday. In the past cases, when miners bounced for a second time before rallying, they mostly bounced from price levels that were considerably above the previous lows. There was only one exception (November 2016) and that was also the case in which the following upswing was the smallest out of the analyzed cases. Back then, only a bit more than half of the preceding short-term decline was erased before the big decline continued. 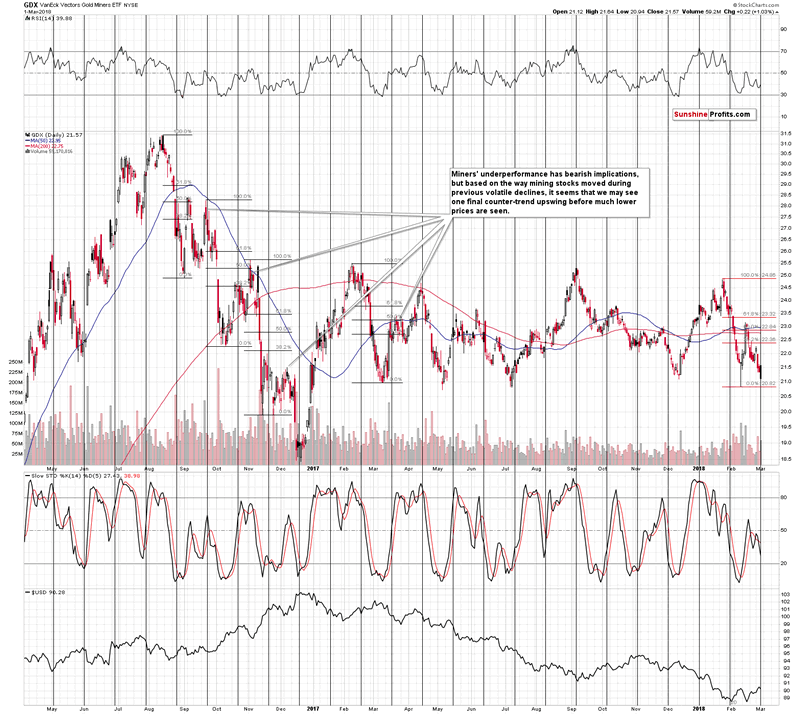 If this 1-out-of-4 analogy prevails, we may be looking at a counter-trend rally that takes GDX to 22.5 or so. If, however, the 2-out-of-4 analogy prevails (we’re leaving out the March 2017 action as there was no 2-day breakdown below the initial low), we can see a sharp decline right away. The reversal that we saw later during Thursday’s session reversal made the analogy to the two-bounce cases more likely. Plus, a reversal on significant volume is generally a bullish phenomenon. The bullish implications of the above remain in place. However, there is something even more important that happened last week and in order to see it, we need to zoom out. Gold shares moved below the very important support level created by the 61.8% Fibonacci retracement that’s based on the most important tops of the past years – the 2016 bottom and 2016 top. Both price extremes are very important and the same can be said about the 61.8% retracement, so the invalidation of the breakdown is indeed something very important. 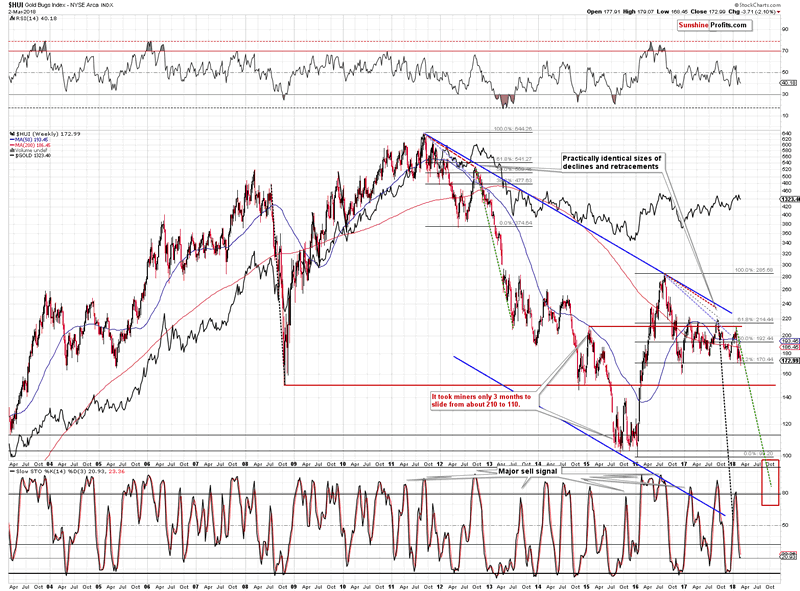 The last time gold stocks invalidated their breakdown below this level, they rallied over 220 relatively quickly. We don’t think that this will be repeated, but some of the bullish implications remain in place. Based on the above chart, 190 can be reached once again, but we hope for mining stocks’ underperformance and a smaller rally as that would serve as a confirmation sign and decrease the risk of opening new short positions. Naturally, regardless of what we hope for, we’ll work with whatever the market provides us with and we’ll report to you accordingly. If you’ve been wondering, the invalidation of the 61.8% Fibonacci retracement did not take place only in terms of the intraday prices. Exactly the same phenomenon was seen in the case of the retracement based on the daily closing prices and even weekly closing prices. Consequently, the invalidation is definitely something significant. Summing up, a the major top in gold, silver and mining stocks is probably in, but based on last week’s big-volume reversals and invalidations in the case of the USD and gold stocks, it seems that we are likely to see yet another small upswing before the big decline continues. The above perfectly fits into the scenario that we outlined in Monday’s extensive analysis, in which gold tops at the apex of the triangle that’s based on intraday prices. This means a top in gold is likely to be seen in a week or so, most likely on Friday. Also, Monday’s alert and the multiple bearish signs of long-term nature that it covers, explain why we didn’t open a long position in light of the short-term buying signals. 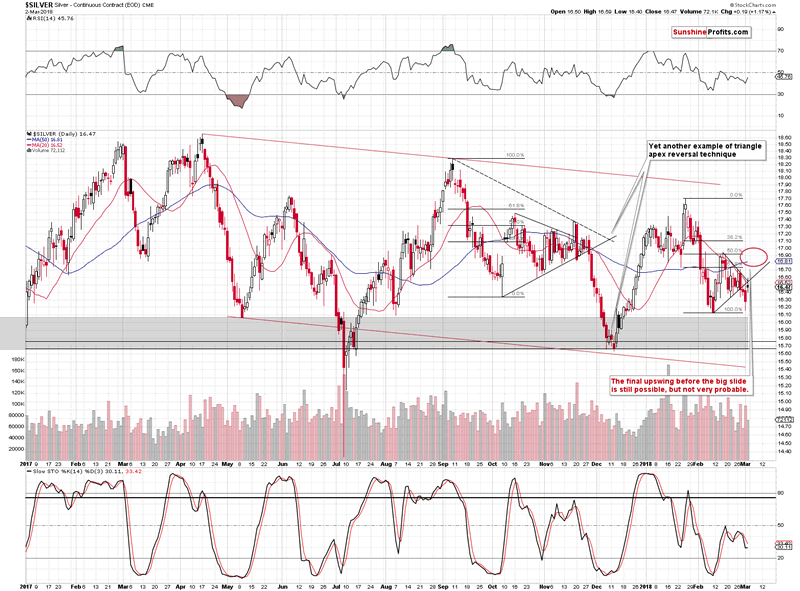 We may open one if we see additional short-term bullish signs, but we are not seeing them right now.